This 3/4 extension variable-height pencil drawer slide has adjustable mounting brackets that can be set at seven different heights and can be reversed for inboard and outboard mounting. For ease of installation track member quickly disconnects using positive lever release. For ease of operation an anti-rebounding stay-close design holds the drawer in a closed position, yet allows easy opening. Warranty: Limited lifetime warranty. Includes all necessary mounting hardware and installation instructions. 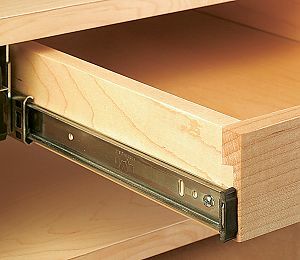 Recommended Use: Medium-duty slide designed for drop-mounted pencil or center drawers. Mounting: Cabinet members mount to underside of desk or table top using adjustable brackets. Drawer members are side mounted. 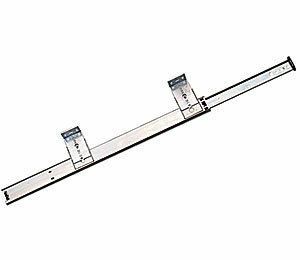 Height: Overall height is adjustable from 2-11/32in. (60mm) to 3-11/16in. (94mm) in 7/32in. (6mm) increments. 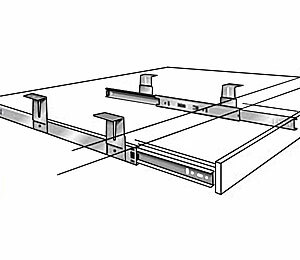 Cabinet members must be mounted parallel to each other and perpendicular to case front. Clearance: Width of slide with brackets in outboard position is 1-5/8in.(42mm). Width of slide with brackets in inboard position is 5/8in. (16mm) per side. Features: Mounting brackets adjust to 7 heights and can be reversed for inboard or outboard mounting. Track member quickly disconnects using positive lever release. Anti-rebounding (stay-close) design holds pencil drawer in closed position, yet allows easy opening. Slide Action: Precision ball bearings for quiet movement and durability.